The logo that appears after entering the trials. The Dark Corridor Trials (闇の回廊トライアル, Yami no kairō Toraiaru?) are the main end-game content of Kingdom Hearts χ[chi] which takes place in the Realm of Darkness. 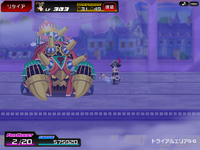 In Kingdom Hearts Union χ, the trials itself are not present but the story and some of the maps are re-used in the main story quests and some events. A Dark Corridor Trial is open for a period of two weeks and about every month a new trial is introduced. In contrast to the main portion of the game, the Dark Corridor Trials don't use AP, Action Points, but a similar yet completely unrelated point system called ActCount. Every action like attacking a Heartless or opening a chest consumes a single ActCount and when the initial amount of 20 ActCounts bestowed by the Bracelet of Light is depleted, the trials end then and there. The only way to re-fill ActCounts is to use a Cape of Light. Every action is also rewarded with a Score, the higher the level of the attacked Heartless, the less turns required to defeat it and the rarer the opened chests are, the more Score will Player accumulate. The final Score determines Player's rank, the amount of TP, Trial Points, and other prizes like cards, items and costumes that will be awarded. 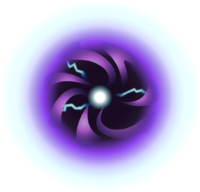 TP are collected throughout all runs of the trials and can be exchanged for damage and defense boosts that will only last for a single trial. The highest Score achieved will be used for the High Score Ranking, which provides additional rewards after the current trial close for good. These rewards will often contain crown clothing items. Apart from regular Heartless the Realm of Darkness is populated by event Heartless, Heartless that only appear during the trials and the Target Heartless. The Target Heartless are essentially single-player versions of Raid Bosses and defeating them is the only way to finish the Dark Corridor Trials without losing all collected items that dropped from Heartless or were found in chests. Every time a Dark Corridor Trial is held the Target Heartless change, often different leveled versions can be found along Omega and event variants throughout the whole trial. The trials are accessed through the Corridor of Darkness at the Fountain Square in Daybreak Town. From there on every room of labyrinth-like trials is called Trial Area (トライアルエリア, Toraiaru Eria?) and consists of darkness shrouded versions of the already visited worlds, separated by areas in the Realm of Darkness. All rooms are connected by Corridors of Darkness that can only be used by having a high enough Score. This page was last edited on 7 September 2018, at 01:13.